If you are on a weight loss journey, celery juice must have cropped up from time to time during your research for healthy foods. You might have hear or read about the #CeleryJuiceChallenge floated by New York Times author, Anthony William, last year. He challenged people to drink celery juice every day for a week and see its miraculous effects themselves. Celery stalks and leaves have been used in international meals, especially Chinese cuisine, for a long time. Celery, in its juice form, has recently come up – in a big way – to form an important part of a healthy diet. It seems like everybody is drinking it and also raving about it. Being a new addition to the list of nutritious green drinks, celery juice has already won millions of hearts with its potent wellness-inducing properties. From improving your gut to helping in the treatment of chronic illnesses, this potion can do wonders to take you closer towards your health goals. Celery has very high water content and zero calorie count. It is said that calories in celery are so low that it further cuts down calories from the body. The high amount of fibre in celery keeps you satiated for longer and avoids you from over eating in a day’s time. Celery contains a compound called 3-n-butylphthalide that curbs rapid fluctuations in blood pressure and also gets rid of bad cholesterol in the body. The detoxifying and cleansing properties in celery keeps harmful toxins away and maintains good health of skin, body and hair. Celery contains all necessary nutrients like vitamins, potassium and blood circulation supporting coumarins, which ward off most of the diseases and infections. 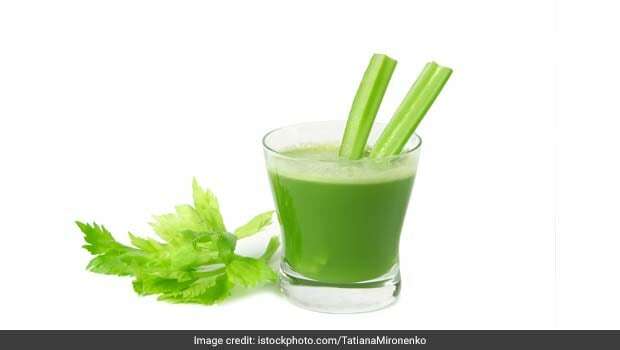 Health advocates suggest that it’s best to drink celery juice early in the morning on an empty stomach. But, if your mornings are always rushed, then you can have it anytime during the day, half an hour before or after the meals. And, if you are not a fan of green juice and don’t want to have straight celery juice, you can create delicious concoctions with other foods to relish this healthy drink. Roughly chop the sweet lime, spinach and celery. Toss it all into the juicer and squeeze a bit of lime for the vitamin C boost and extra hit of flavour. Toss all the ingredients in a juicer and blend. Roughly chop all the ingredients and blend them in the juicer. Strain or have as is. Include celery juice in your health plan and gulp away to fitness. But remember, celery juice is wholesome, is a fad, but it’s not a miracle. Juicing and drinking other nutritious vegetables and fruits is also important to maintain a balanced diet. Ideally, you can mark days for different juices of different foods and build your health by the day.